We invented this handy little giant. 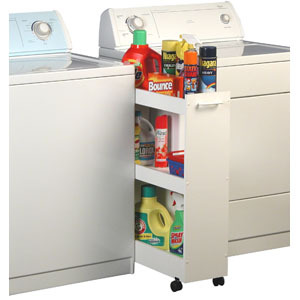 Our Laundry Caddy is a compact 3 shelf unit that nestles nicely between the washer/dryer. Raised side rails keep everything in place. This includes all your laundry necessities like: detergent, bleach, fabric softeners, cleaning solvents, an iron and anything else you have. A must in every garage, laundry room or wherever it is needed. Rolls around smoothly on dual track carpet casters. Item Weight: Approximately 12 lbs.